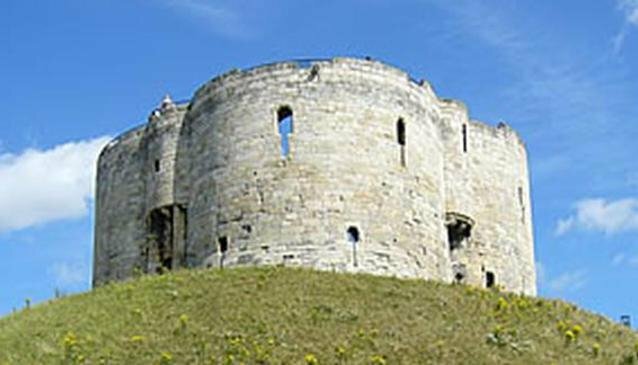 York is a fantastically compact city, and with Clifford's Tower at the very heart of it, visitors can enjoy unrivalled views over the city to help them better understand York's fascinating story, from the gothic splendour of York Minster to the iconic Terry's building that housed the city's chocolate heart! Standing high on its mound, the 11th century Clifford`s Tower is the last remaining part of York Castle. In 1068 William the Conqueror built a mound and the round tower, of wood, to establish his control in the North. The castle's most tragic event took place in 1190, when half of the city's Jewish population took refuge from persecution there. They and the then wooden tower were burned. Later, in the 13th century, it was rebuilt in stone by Henry III . The tower, is known as 'Clifford's Tower' because in 1322, Edward II had the rebel Lord Robert Clifford hanged in chains from the walls. It was the central keep of the castle. There were more buildings, surrounded by great walls and then a moat around the whole fortress.